What happened to the oil from the Deepwater Horizon spill? After the accident on the Deepwater Horizon platform five year ago in the Gulf of Mexico, an estimated 210 million gallons of oil leaked at a depth of about 1,500 meters for 87 days. This spill was unusual, not only because of the duration and quantity of oil spilled, but because it was also the first oil spill at such great depths. Where did the oil go? Initially the oil floated upward toward the sea surface. Crude oil consists of many different chemical components, each with different properties. Some of the components of the released oil formed a deep plume at around 1,000 meters of water depth, whereas another fraction continued its upward path until it reached the surface to form an oil carpet. About 25% of the oil was recovered or removed by skimming and burning directly at the sea surface. Some of the oil evaporated and some was rapidly consumed by bacteria. But a large fraction dissipated, dissolved, or dispersed, naturally or due to the application of dispersants – chemicals that break down the oil into small droplets. These components of the oil remained in the water, even if concentrations were too low to measure reliably. My research has focused on how oil and dispersants interacted with natural organisms in the water. My experiments suggest that a significant portion of the oil spilled from the well has been carried to the seafloor by marine particles and organisms, a finding that can help guide cleanup efforts in future spills. Tracking oil as it ages is complex: As oil weathers, its composition changes chemically with the aging process depending on environmental conditions, like pressure, temperature and light. For example, the fingerprints of petroleum are the not the same when exposed to sunlight versus when it remains in the dark. 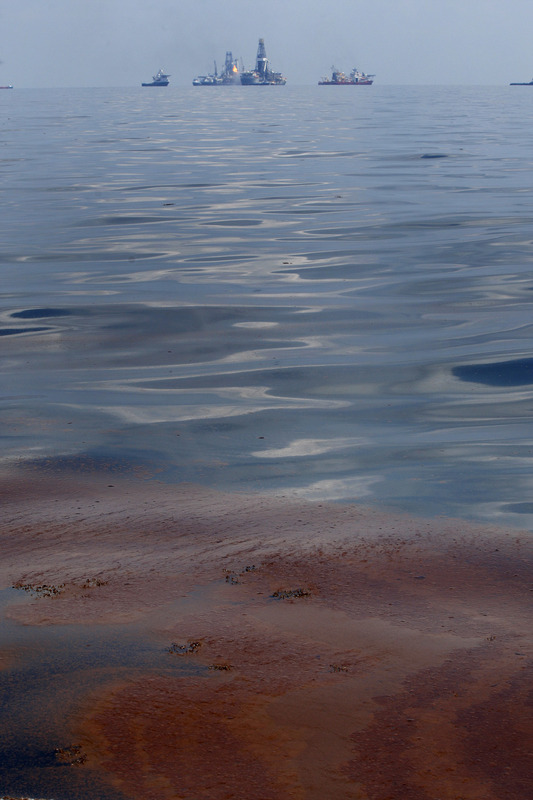 Nevertheless, it is possible to track the Deepwater Horizon spilled oil. Components of the oil mixture have been found in ocean organisms, which indicates that they entered the food web, and oil has been found on the seafloor, where marine life such as corals were heavily affected. Finding large amounts of oil at the seafloor was unexpected, as fresh oil usually floats. 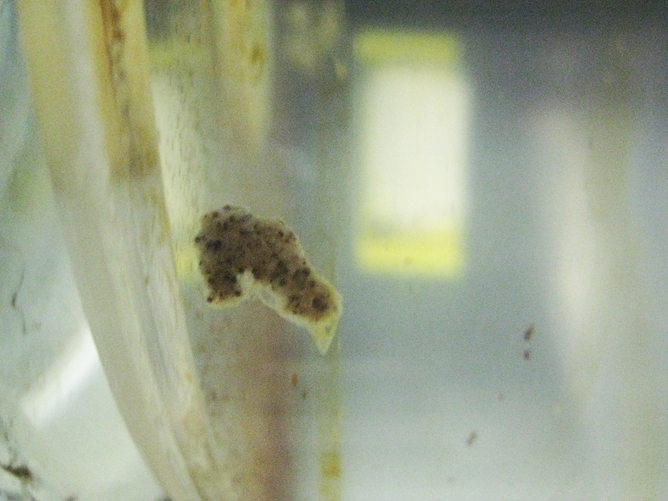 Ocean gunk: a photo of marine snow created in Passow’s lab roller tables. How did the oil reach the seafloor? This is where so-called marine snow comes in. It is not snow; we just call it that, because in the water these sinking, millimeter-sized particles look like falling snow. Marine snow consists of many smaller particles, including phytoplankton, feces or feeding structures from zooplankton, or it’s made of bits and pieces of miscellaneous material, all stuck together. For example, when phytoplankton grows well, reaching high cell densities, the tiny algae may stick together to form marine snow aggregates. Or, some types of zooplankton’s feeding structures, similar in some ways to spider webs, are discarded when clogged. Such clogged, sticky structures also form marine snow. More recently we discovered that some bacteria respond to oil by forming large amounts of mucus, which collapses, forming very mucus-rich marine snow. Because it is relatively large, marine snow sinks rapidly and is one of the main transport vehicles for small particles to the deep sea. It provides food to many creatures living at great depth or on the seafloor. 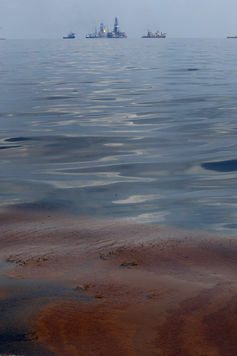 Oil, when present, is incorporated into marine snow. Oil may be trapped during the formation of marine snow, or later scavenged when sinking snow passes through oil-contaminated water. Marine snow is frequently very sticky and collects additional particles and substances while sinking. In combination with suspended mineral particles, oil may also form oil-mineral aggregations, sometimes called OMAs, which are much smaller than marine snow, but also sink rapidly because of the high density of mineral particles. It is likely that a significant fraction of the oil released during the Deepwater Horizon spill was transported to the seafloor via different types of marine snow and OMAs. 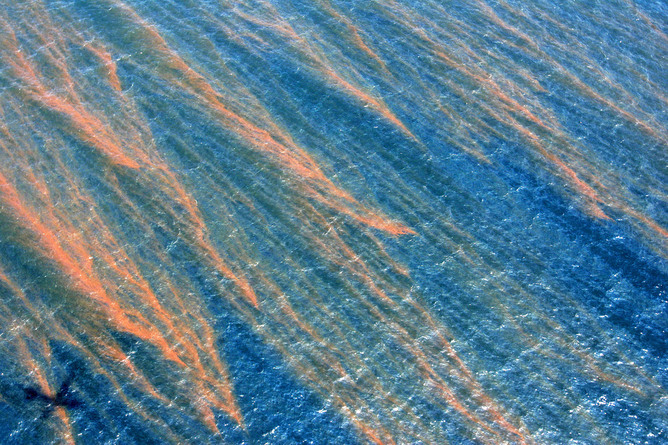 Sedimentation of oil containing marine snow or OMAs and its accumulation at the seafloor has the effect of re-concentrating the oil, which had dispersed in the water. Undoubtedly, marine life at the seafloor and animals feeding on those living at the seafloor will be affected in a variety of ways by such an input. Because the seafloor of the Gulf of Mexico is not level – it has mounts, gullies and canyons – sedimented marine snow, or floc, does not necessarily stay where it falls. There is a lot of resuspension and lateral flow of floc just above the seafloor, with oil and particles accumulating more heavily in low spots, and sparsely on mounts. As a consequence, estimating the thickness of the sedimented layer is difficult. Moreover, the extent of the affected area – that is, the size of the footprint of the spill on the seafloor – is also challenging to approximate, making it difficult to assess how much of the spilled oil arrived at the seafloor. Nevertheless, many scientists believe that the amount of oil that sunk to the sea floor was between 3% to near 25% of the total spill. But the research is ongoing and our understanding of these processes is still increasing. Five years is actually not a long time for science to understand a process as complex as the pathways of the oil after a large spill. Some of the impacts of the Deepwater Horizon spill on the marine life and ecosystems of the Gulf of Mexico will only become visible in future years. We use oil products daily. As we have depleted the easily accessible reservoirs, we now extract oil under increasingly more challenging conditions to satisfy these needs. Spills are bound to happen. Reducing our dependency on oil will be one significant step towards decreasing the likelihood of spills.